Carmel-by-the-Sea, CA,- If there’s a more romantically spectacular place in California than Carmel, we’re hard pressed to find it. Carmel-by-the-Sea, a small oceanfront community also has a reputation as being a bit pricey. 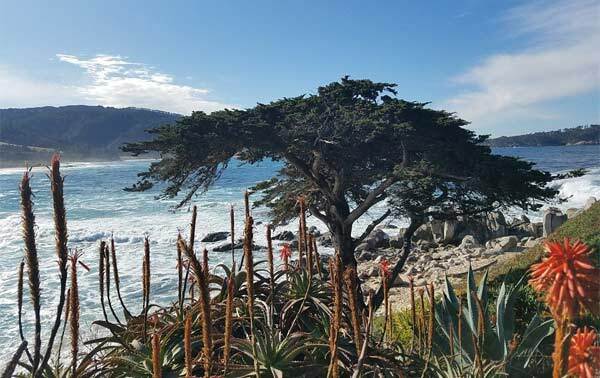 Unparalleled ocean views, gourmet dining and first rate shopping experience all add to Carmel’s never ending appeal which drives prices out of bounds for many travelers. Thankfully, options are available that can make Carmel a regular in your travel destinations. With some careful planning, you too can experience the splendors of Carmel offers without breaking the bank. Consider a mid-week visit during the offseason and you’ll find yourself saving big while avoiding the peak weekend crowds that descend upon Carmel. For lodging, The Hofsas House is an affordable option with an ideal location and friendly, helpful staff. This Bavarian styled hotel recently celebrated its 70th year and we’ve been here several times. You’ll love its walking proximity to everything Carmel! You can easily park your car and forget it during your entire stay. Mid-week rates vary on rooms, but at around $135 night, it’s an incredible deal for a premium location. Rooms are large, clean and comfortable. Inquire about checking into an ocean view room with a fireplace. Family size accommodations are also available here. Perfect for on the go, complimentary local pastries along with juice and coffee are provided each morning in the lobby. There’s so much to see and do in Carmel, so we often rely on the staff to find some great options for affordable fun. Learn more at Hofsas House. When it’s time to take a break from window shopping, head down Ocean Ave toward to beach and hang a left on Scenic Rd. Walk a short distance and hop on the Scenic Road Walkway for one of the most incredible oceanfront strolls anywhere in the United States. We suggest walking all the way to Carmel River State Beach. Be sure to bring a camera and dress in layers. There is a public restroom along the walkway. NOTE: We highly recommend planning to visit this area just before dusk to soak in over the top view sunsets.